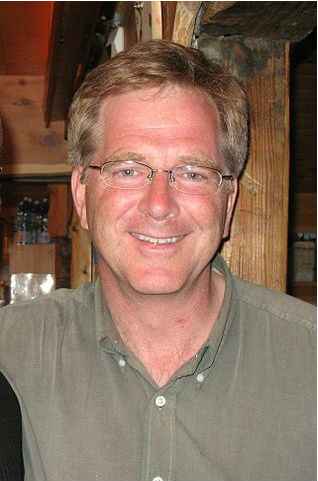 We had a chance to go to a Rick Steves lecture the other night, though lecture is way too stuffy a word for it. The celebrated travel journalist, broadcaster, and entrepreneur actually has a bit of a stand-up routine that he brings around: part advice, part humor, and part low-pressure sales pitch for his tours and travel products. Rick was in jeans and a sport coat, standing taller than we expected, blondish hair going silvery, and much funnier than one would imagine. Go strolling and people-watching in the evenings around the main square, or just follow the crowd. It’s a European custom that provides the real lowdown on a town. Beware of any guide whose tour will include a “factory visit” or demonstration. This is most likely his cousin’s diamond polishing factory and shop, Turkish rug store and shop, cigar factory and shop. etc. Private apartments or bed and breakfast accommodations are much more fun than chain hotels. If you’re feeling poor or cheap, many youth hostels are now all-age hostels and affordable options. Mom was right: those gypsy women begging on the crowded sidewalk are probably pickpockets. Mostly we pretty much knew and agreed with all this. Exceptions: I, of course, need to shop everywhere, though not to buy everywhere. It is true that art museums are more exhausting than walking, but history and industry museums can give us great background on the region’s past and meaning. And finally, I sure hope Tom didn’t hear that part about hostels going all-ages. He’s not to know that one can sleep for $20 a night. Great travel tips and a fun-to-read post. Thank you and Happy New Year. Thanks GE1! One fix: for visiting tourist-must spots, Rick suggested spending not just the evening, but the whole night. It’s also enlightening to see a town opening up in early morning light, before the crowds arrive. I wonder if Bob frequents museums? That’s so exciting! I would definitely want to meet him if only to hope that some of his travel bona-fides rub off on me!